Hunter is a member of the Oglala Sioux Tribe on the Pine Ridge Reservation in South Dakota and CEO of Native American Natural Foods. The company, which she cofounded in 2007, makes all-natural, low-calorie buffalo snacks (Tanka Bars, Tanka Sticks, Tanka Bites) sold in over 6,000 retail outlets, including Whole Foods, REI and Costco. Larger than the state of Delaware, the Pine Ridge Reservation is in Shannon County, one of the poorest in the United States. In a 2012 New York Times op-ed, columnist Nicholas Kristof dubbed the reservation “poverty’s poster child.” At the time of his reporting, half the adults over forty had diabetes and the unemployment rate hovered around 70 percent. Buffalo in Yellowstone National Park. Photograph from Flickr user, Jerry Burke. Hunter’s company, which aims to source its food and ingredients from Native American producers, is now beginning a new project: Help native ranchers find economic opportunities and create more Native American sources of buffalo meat for her products.Currently Native American Natural Foods buys the wild rice it uses from Red Lake Nation Foods in Minnesota and its cranberries from processors in Wisconsin who deal directly with native growers. 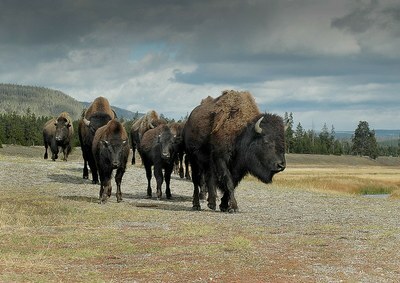 Yet only 17 percent of the company’s buffalo supply comes from Native producers. The new project, called the Tanka Fund, would help finance and support Natives in raising bison on Indian land in Western and Midwestern states. To make this happen, the company recently teamed up with Indian Land Tenure Foundation, a national organization that restores Native control of reservation lands that have fallen out of tribal ownership. Raising bison on Indian land isn’t new. Currently, there are groups like the Intertribal Buffalo Council, made up of 59 tribes, which own 15,000 to 20,000 buffalo intended to serve tribal communities. The Tanka Fund, however, will be looking to support entrepreneurs looking to engage in the market, rather than restoring communal herds. The Tanka Fund has a great opportunity to restore Indian land ownership and bring economic opportunities to depressed areas like Pine Ridge. But ranching buffalo isn’t easy, and critics of the idea say the costs can be prohibitively expensive. Even Hunter says that raising buffalo can cost significantly more than raising beef. The wooly creatures need to be penned in with stronger fences, and they require more space to accommodate nomadic habits. Dave Carter, head of the National Bison Association, doesn’t entirely agree. He says the initial investment is no different than the cattle business. “You don’t need fencing like Fort Knox,” he says. “It’s a matter of having good grass and a good social mixture,” by which he means understanding the social nature of a herd. Because buffalo are constantly on the move, the U.S. Department of Agriculture recommends the same amount of land for both bison and cattle. Bison are easier on the land, however. “They take a bite, they take a step,” Carter says, as opposed to cows, which stay in one area and eat grasses down to the soil, exposing it to erosion. Another advantage to raising buffalo: the animals eat different grasses at different times of the year. This helps restore root systems, which are critical carbon sinks. Prairie grass typically grows roots 15-18 feet deep with 80 percent of the plant’s carbon below the surface of the soil. Restoring the prairie could go hand-in-hand with carbon credits, adding even more financial incentive to the project.